From all of the AeroDynamic crew – A huge congratulations to Andrew for passing his Private Pilot checkride with DPE (designated pilot examiner) Yuzo Wakita. 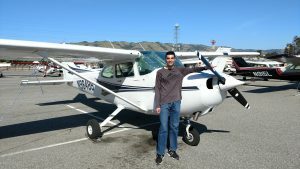 Andrew is a full-time student at Berkeley who took on the extra workload of earning his pilot’s license. We are so proud of Andrew and his instructor Jason for all their long hours and diligence to earn this monumental achievement! Tags: bay area, california, Cessna 172, flight training, KRHV, pilot, Pilot license, private pilot, San Jose.